Wednesday 8:30 pm – The curfew has started. Hopefully overnight the army is able to bring order to the city. The internet has proved to be a very valuable tool for spreading information. If you turn on the Thai TV or radio right now, it is just patriotic pictures and music – just like when we have a coup! It seems the government doesn’t want people seeing how bad things are, or thinking about joining the mob. I’m going to share more pictures with you. None of these are mine. There is also a Thai language website you can go to HERE that has a lot of pictures. Fair warning: the pictures on that website include some very greusome ones. Plaza in front of Zen department store at Central World, the second largest mall in Asia. You can see this same area in a video I posted showing Bangkok Thunderstorms a few months ago. View from (probably) the Intercontinental Hotel looking at the Zen department store at Central World. You can see the flames all along the ground floor and out of the roof. Most likely, the department store and most of the mall has been / will be totally destroyed. Looking towards Siam Square. You see the Novotel Hotel on the left. 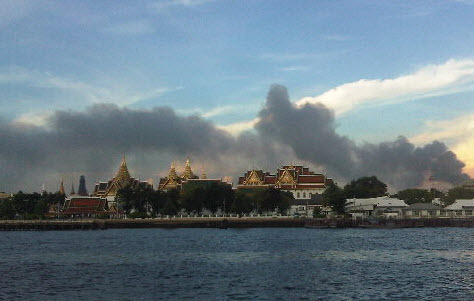 The smoke is rising from the area around the Siam Theatre, which has been destroyed. Red Shirts also torched city halls in at least two provincial capitals in the northeast. This is Ubon Ratchatani. Finally, a view from the Thonburi side of the river, looking back towards the Grand Palace. The smoke you see is coming primarily from the Siam Square / Ratchaprasong area. To share some perspective, as I’m talking with Tawn and with friends, and judging from Facebook comments, etc. 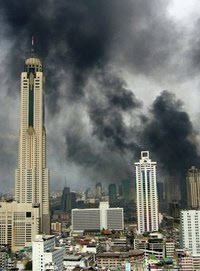 the mood here in Bangkok reminds me very much with the mood in the US the morning of September 11, 2001. Now, please, nobody jump all over me about the number of deaths there versus here, etc. 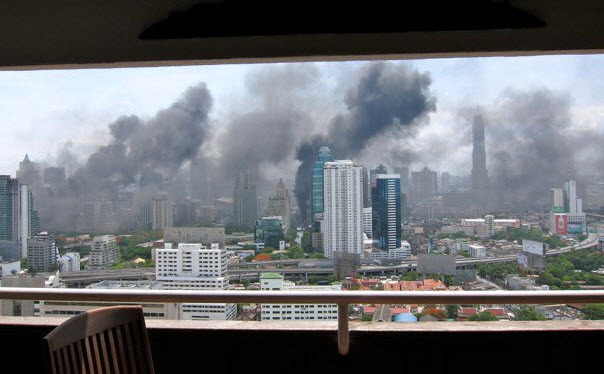 The point I’m making is that right now, these Bangkok residents are looking on in utter disbelief as their home, their city is going up in flames. The scale is so large that it is almost inconceivable. 1. Siam Square and Paragon: firefighters are unable to enter the area, red-shirt protesters are armed and are shooting at will. Siam and Scala cinemas destroyed. 11. Central World Mall: Destroyed. 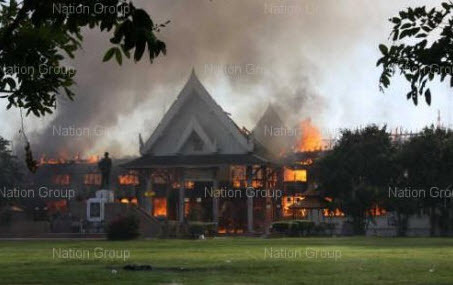 Wednesday 5:25 – Reports from reliable sources indicate that both the Siam and Scala theatres, and presumably many of the adjacent shops, are burned down. 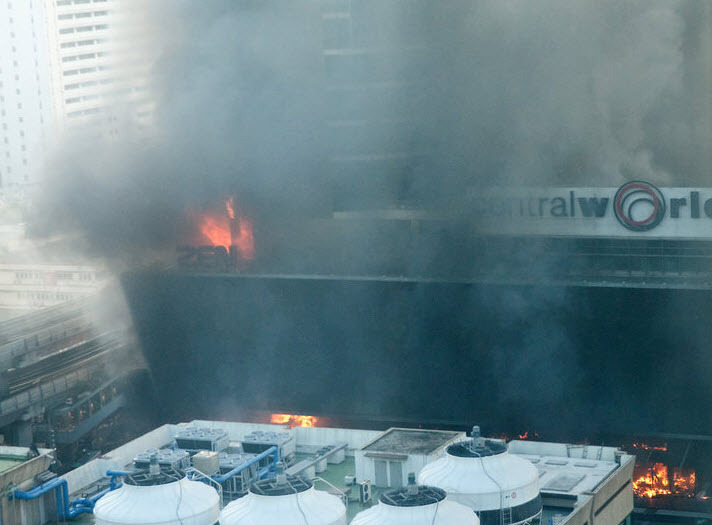 Central World Plaza, pictured above, is engulfed in smoke and it looks like damage may be extensive and, possibly, total. The building with the waterslide-like lighting on it is where I had dinner a few months ago with visiting friends. Wednesday 4:35 – Man with covered face set fire to ground floor of Channel 3 TV station, located on Rama IV directly south of our area of town. People trapped inside. Set fire also to Bangkok Bank branch in the lobby. Protesters set fire to shops in the Siam Square area. Siam Theatre (one of the few independent cinemas in town and a favorite of mine) has collapsed. Fire is still burning but protesters won’t let firefighting crews fight the fire. Bangkok Post, Post Today, and The Nation have evacuated their buildings as Red Shirts reportedly believe that the media was on the government’s side. They have been actively targetting journalists in the last 24 hours. There are numerous helicopters and police planes circling overhead, keeping an eye on things. Curfew tonight 8pm – 6am. Taken by another friend of a friend. Wednesday 3:30 – Additional fires have been set in various areas of the city. 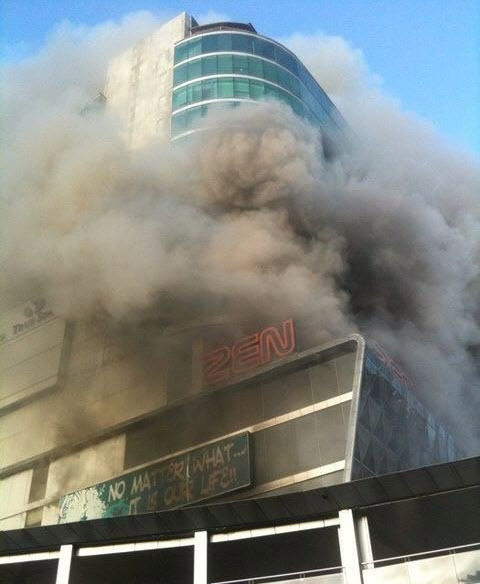 Reportedly a large fire at the Stock Exchange, corner of Rama IV and Asoke, very close to where I used to live. Can see the smoke – lots of it – from our current balcony. Also some white smoke, which I take to mean that the firemen are getting water on it. A reliable source reports that Red Shirt radio is encouraging listeners to set fire to any local bank branch near them. “You are your own leader now” they are saying. Curfew reportedly in place for tonight so army can clean up. This morning (Wednesday 5/19) the Thai army broke down the Red Shirts’ barricade at the Silom/Rama IV intersection and within two hours had taken back about a half-mile stretch of Ratchadamri Road, all of Lumpini Park, and most of Wireless/Whittahyu Road. The army stopped about a half-mile short of the main rally site at the Ratchaprasong Intersection. During this operation, all reports indicate that the army used great restraint however it seems the Red Shirts were targeting foreign and Thai journalists. Several were shot and at least one, an Italian, is dead. At 1:15 the Red Shirt leaders surrendered to the Royal Thai Police after speaking to their supporters and asking them to go home. Unfortunately, there are several thousand angry Red Shirt protesters who are too amped up right now and they are directed their anger in a variety of ways. As of 2:41 there are numerous confirmed reports of fires burning at Central World Mall and possibly also at Gaysorn Plaza and Siam Paragon. This, in addition to fires set to the tyre barricades elsewhere in the protest zone, have turned that part of Bangkok into something that looks post-apocolyptic. I will provide updates to this entry throughout the day as more news and photos become available. As bad as this looks, I think the fact that the Red Shirt leaders have surrendered means that we’re nearing the end of this mess. @MAXIMO – Sadly, Max, any shred of sympathy I had for the Red Shirts, any belief that maybe they had some legitimate grievences to air, has gone up in the smoke of the fires they’ve set in what appears to be a deliberate and planned attempt to cause chaos and inflict as much damage on the country as possible. Democracy gives you the right to freedom of speech and expression, but not the right to destroy property and threaten lives. @Redlegsix – For the first time, Ruth Ann, I’m seriously thinking that I should head to the airport and leave. Taking Tawn with me, of course. I do hope things are going to normalize soon. This is so sad when senseless destruction of lives and property is used to try to force change. The change that occurrs in those cases is rarely for the better… Please stay safe. @murisopsis – I think there are now wounds and resentments so deep that it may take a generation to heal. Glad you are safe. If you decide to fly out, pick your route to the airport carefully. Left a comment on the pulse but *big bear hugs* to both you and Tawn… I’ve only recently become a subscriber but I’ve loved every entry I’ve read so far. Sad to see all the destruction going on in such a beautiful city. =/ Hope you two stay safe in the chaos. Yikes seriously? Targeting REPORTERS?! Even foreign ones? !Can’t believe that the thousands of people cannot be stopped by the police and/or military…Be safe and it sure looks horrible. @Redlegsix – Sadly, even if we fled to the US, Tawn wouldn’t be able to stay there for more than a few months thanks to the federal law’s “Defense of Marriage Act” which doesn’t allow our marriage to apply for immigration purposes. Oh, what a sad time for partisan politics in the US to get in the way! @yang1815 – They are trying to get it under control but Bangkok is a warren of small alleys. Squeeze the protesters and they escape from various routes, popping up elsewhere. @venice – I know how much this country means to you and am sure I know the pain that it causes you to see this news. @moolgishin – Sorry that as a new subscriber I’m having to expose you to such depressing news! I promise, we’ll get back to happier topics soon! =D@Toro69 – Thankfully, eastbound to the airport seems to be the safest route and we live on the more easterly side of the city. @christao408 – Hey, no worries, just take care of Tawn and yourself, and the happy news will come of its own accord. the latest i heard was about a rebel general who was shot. hope the fighting ends soon.stay safe. Wow wow wow…stay safe Tawn. Hopefully this will end soon. The red shirt probbly made some wrong strategic moves, and they lost whatever the sympathy people, including me, have with them. Long term wise, it is not good to have political issue to become violent and army shooting people either. Sad to see both sides not able to talk it out and end peacefully. At the same time, I sense a lot of anger in the country side. What ever that is? I worry the conflict may actually spread to the country side? Maybe. You and Tawn stay safe! @stevew918 – Well said Steve. Can’t agree more. Chris — I do hope you and Tawn will do what you need to in order to stay safe! It looks very ugly — way out of character for what I had imagined Bangkok to be! @christao408 – BTW do you think this situation would qualify for any type of international refugee/asylum/humanitarian/armed conflict laws? @stevew918 – Steve, the conflict has spread to other provinces already. The army has acted with tremendous restraint, even as the supposedly peaceful, unarmed, pro-democracy demonstrators have shot guns and thrown grenades at them. Had they not acted with restraint, the death toll would be in the hundreds by now. @Roadlesstaken – We’ll do everything we can to stay safe Alex. @Renatojr3 – Yes, the army general who was actively working with the protesters, helping them prepare their defenses. I’d feel a little worse about his death if he hadn’t been working so hard to undermine social order. As I was watching the news with disbelief, my sympathy for the Red Shirts has evaporated. The extremists in their group has become terrorists in vandalising the city. I had fond memories of Siam Square and the cinema itself, and also the Central Plaza. I hope the Siam Paragon is still intact. Chris, is the Channel 3 station inside the Emporium building? Just wondering because I used to stay there and that area is somewhat located south bound in the Sukumvit area. I hope the rampage will end soon. You and Tawn stay safe! That looks horrible. It’s hard to sympathize with the Red Shirts if they are causing all this harm to innocent people. Be safe! That’s so scary that they would set fire to so many different places. There has to be a better way to protest if that’s what they are trying to do…Stay safe! As a child of the 60’s I remember the protests and the riots during the civil rights movement. This looks very similar and will probably have similar consequences. Unfortunately Thailand has a shaky economy as it is. It will take many years to recover from this. All distruction, no progress toward change, what good is it? Mob mentality has taken over. There is no reason or thought behind any of these actions now. Please keep you and Tawn safe. Stay home and out of harm’s way. I hope you have your bags packed- just in case. Perhaps peace will decend soon… Hope the firefighters can do thier jobs without the additional danger of gunfire! While I was reading, I was thinking that these people, although started with great energy and intentions, was not able to handle its organization. There was too much energy spilling all over, which turned from a great demonstration to a great riot.They lack leadership.I hope things are going ok with you though.I am worried. It`s so terrible, seriously. So terrible…..
of course i can conjour something flippant to say…but I’d rather just hope you’ve found what safety or the best chances possible for you and yours. We know you and Tawn will do everything in your power to remain at a safe distance from this unrest and violence. Anger causes otherwise peaceful people to do crazy things, so while the Red Shirts may have legitimate concerns, this is not the best way to reach an agreement. I too remember the civil rights activities of the 60’s-70’s in the US. Curfews make one feel very confined. Suddenly all you want to do is go out for an ice cream cone, even though you may not even care for ice cream. My thoughts are with you and Tawn, please stay safe and stock up on necessities. I do understand what you meant when you compared it to 9/11; it’s scary how everything that is familiar and dear to you changed right before your very eyes. I hope with the surrender of the Red Shirts the country can start process of healing and slowly build the economy. I’ve been following this at work on and off through NYT and the Globe and Mail. I am glad you and Tawn continue to be fine. I know Thailand has had it share of riots before. I was hoping that people will remember and learn from history. It looks like this will set back any hope for social progress / reforms for quite some time. @yang1815 – No, I doubt it. While it is bad, it is only bad in a limited sense. Thing the riots in LA after the Rodney King verdict. It isn’t systemic, which would be a requirement to qualify for refugee status. @slmret – Thank you. Some long pent-up anger being released, but it seems primarily being released by unidentified “black shirts” who seem to be former military with an axe to grind against the government. @murisopsis – Firefighters and emergency workers have been unable to attend to many situations precisely because of mobs and gunfire. 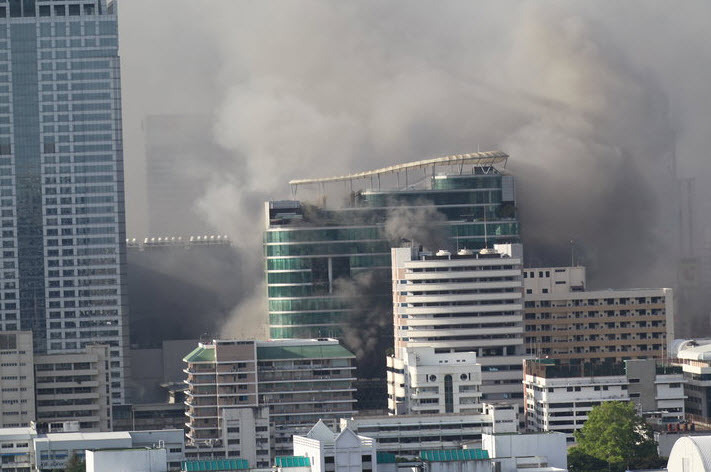 Central World, the second-largest mall in Asia, was completely destroyed as now it seems that firefighters weren’t allowed around it for the first three or four hours that it was burning. @stebow – Yes, it really is reminiscent of the 60s riots, isn’t it? Probably some similarity in motivations, too. @new_paul – I agree that it is more dangerous, simply because the “soldiers” on one side are following no rules of engagement. Thanks for your concern. @TheCheshireGrins – There’s an interesting analysis I read yesterday that explains how Thai democracy hasn’t evolved to a point where peaceful protest is a concept. In their minds, when it gets to the point where you’re on the street, it is already too far gone to remain peaceful. @waiszeblogs – Agreed. 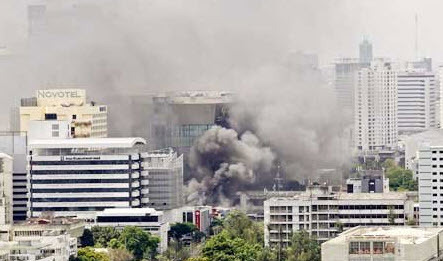 @CurryPuffy – Gary, there was word of a fire at Paragon but it seems not to have been extensive. 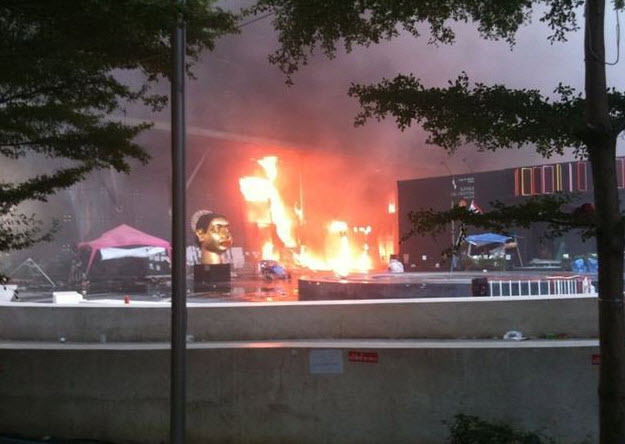 Central World and some parts of Siam Square were definitely burned down. As for Ch. 3 it moved from Emporium a few years back and is now in a building on Rama IV almost due south of Emporium, kind of where approximately Sukhumvit 30 would hit Rama IV, if it connected. @Wangium – That’s a very astute analysis, Jason. Several academics pointed out a few weeks back that the Red Shirt leaders were themselves splintering and it was natural for the masses behind the protest to splinter, too. Some clearly didn’t want to surrender and go home. And as for the power behind all this, we need look no further than one Thaksin Shinawatra, former PM who was ousted in a coup in 2006 and subsequently convicted of corruption. @nimbusthedragon – Yes, hard to find words to describe it, isn’t it? @I_once_was – I, too, have found that for once I’m not able to wring out any appropriate dry humor. It is just too sad a sight to see. @jandsschultz – Thanks, hope you rec’d the message I left for you in the morning. @nutz4walnuts – While I hope there will be healing, my suspicions is that none of this has resolved any underlying issues. It would be a good idea, in my humble opinion, for the government to announce fresh elections once the mess is mopped up, to reinforce that this is a democracy (which it is) and that people have a voice. I don’t think the current government enjoys widespread support. @ElusiveWords – Unfortunately, our riots have never been anything like this. I’m unhappy with the way the Times, CNN, and other western outlets have been covering this. Al Jazeera English has actually been doing the best job. Stay Safe…..really sad to see that! Hope you, along with everyone in the city, are holding up OK. I have been following events in Bangkok very closely. I feel very saddened because Thailand is so near here and I have always love Thailand having travelled there so many times. Seeing your pictures here, I feel like crying. These places are familiar places, places where I have been. I just can’t believe this is happening in a place where I always thought was so peaceful and the people so warm and friendly. @icepearlz – When you feel you know a people so well, it especially hurts to see that they are fighting with each other. @CurryPuffy – Hard to say what is still standing, Gary. There is a lot of confusion and hard to get clear media reports. @Texana – I hope both sides find a calmer, rational way to air their disputes. Now a lot of people on the anti-red shirt side are screaming for blood. @kogepon – Doing the best we can, thanks. Chris…does it look like things may begin to calm down a little bit and that you and Tawn will be able to stay there in your home and not have to make contigency plans to leave? And I do understand exactly what you are saying, when you equate the feelings in Thailand to those of the people in America on Sept 11th!! It is so devastating to think that someone could do this to the country that you love, and in this case, the “enemy” are their own fellow citizens!!! I can’t tell you how much I appreciate all of the updates and such that you have been giving us! Not only is it nice to know that you and Tawn are safe and secure but the information that you have shared about the “inside story” of how things are progressing is very important!!! Stay safe!! Ruth AnnOH yes, stupid question…but as I see all of the destruction of businesses and such, I can’t help but wonder if the concept of insurance has been wide spread enough in Thailand that most of these people will be able to restart their businesses? I am not thinking so much of the big concerns, the theaters and shopping centers, since I am sure they have insurance, but I am thinking of the individuals that are effected, the little local jeweler who’s store was ransacked or the one who runs that Thai Silk store that was burned to the ground…do most of them have insurance of some sort to help them get their lives jump started again? Also, does the Thai government have some sort of “workers compensation” or something of that nature that will allow the individual worker who are suddenly without a job to be somehow assisted as they look for new work? @Redlegsix – Ruth Ann, as of 4:30 pm on Thursday it looks like things have calmed down. There were no major incidents reported today and protesters in some other provinces dispersed and allowed police to clear their barricades with no incidents. Curfew is extended for another three days to allow time for the authorities to control the situation better and we’re considering taking off for the weekend just for some fresh air.I’m glad you appreciate the information. While I make no claims at journalism, I’m happy whenever I can provide some additional information or perspective to those outside Thailand.Regarding your insurance question, I suspect that the vast majority of those small shop owners, particularly the dozens (or hundreds) affected by the widespread burning and looting in Siam Square, do not have any insurance. While the government may end up creating some sort of compensation scheme for them, it will be very limited. I weep for Bangkok and fear for my cousins. And I also mourn the demise of Central WOrld. This means I will no longer eat at my favourite restaurant, Eat’s My World. This is very devastating news.Damn the red shirts! @Ajah – Yes, I think we are all mourning the loss of so much property. I hope the country can heal and that more permanent solutions can be found to the deep political wounds.